It contains premium botanical extracts blend with the natural minerals in pure 15,000-year-old Waiwera artesian water. Omega and antioxidant-rich raspberry seed supports increasing lipid content and decreasing moisture loss and aloe vera and marshmallow help to soothe irritated or stressed skin. Mamaku black fern acts to regenerate and foster healthy cells. 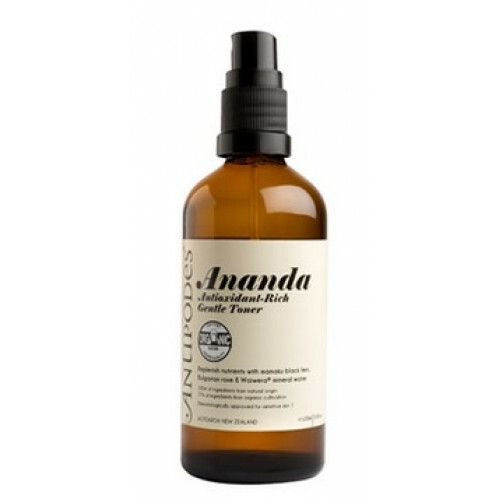 Spray generously across your face and neck for a immediate moisture boost several times a day. It is suited to irritated and sun-damaged skin conditions, and dermatologically approved for sensitive skin. Certified organic by BioGro: 100% of ingredients from natural origin and 77% of ingredients from organic cultivation. Certified vegan by the UK Vegetarian Society, a globally respected organisation for the assessment of vegetarian and vegan status. Aqua (Waiwera Artesian Mineral Water), aloe barbadensis (aloe vera leaf)**, cyathea medullaris (mamaku extract), gluconolactone, sodium benzoate, dehydroacetic acid, benzyl alcohol, bisobolol, althaea officinalis (marshmallow extract), rubus idaeus (raspberry extract), rosa damasca (Bulgarian rose oil)**. ** Certified Organic ingredient. Waiwera artesian water is naturally mineral-rich with a variety of beneficial minerals. Mamaku black fern helps to firm and protect your skin, and generate fresh cell growth. Raspberry oil is rich in essential fatty acids and Vitamins E and A and helps improve skin elasticity and suppleness.